If you are looking for more than one day in Wadi Rum here are a number of possibilities that can be added on to any of the other trips. See also below for two day programs. 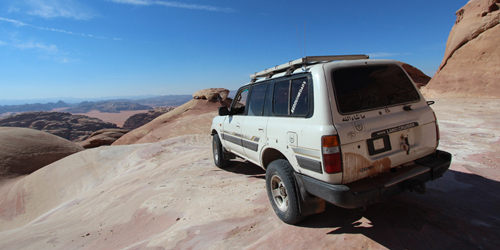 We start with a full day in 4x4 following the "Day with the Bedouin" route. The second day, after a night in the desert we drive to Jebel Khasch. This is a magnificent 3 to 4 hour walk and very popular. 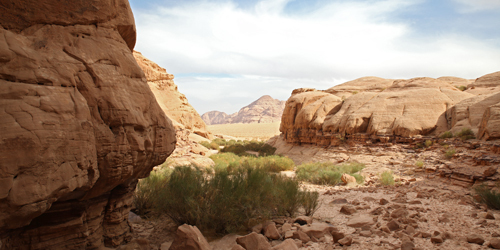 We highly recommend this 2 day tour, which we believe provides the best Wadi Rum visit possible for those who enjoy hiking off the road. Price: 120 JD/person for the 2 days for 2-3 people. This includes all meals, overnight stay, sleeping equipment and the guide for the hiking. Start towards the Seven Pillars of Wisdom and turn into the Makharas Canyon and the massif of Um Ishrin. 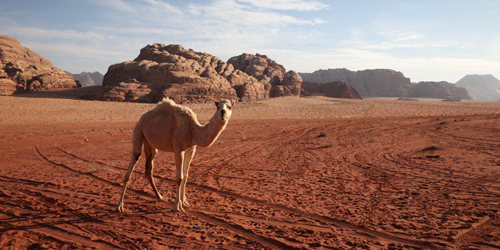 It's a beautiful valley and popular with wandering camels! Later we head towards our desert camp at Jebel Raka. The next day we head through the Barragh Canyon. From here we go back to Rum Village passing Jebel Raka and Lawrence's House. 6 to 7 hours trek in a day. On the first day we start off with the classic jeep tour as described in the page "A day with the Bedouin". After a night in the desert we start off on the camels for a 4 to 5 hours trip. We are not offering an itinerary, since it can vary with each client. It's a 5 hours ride on the camel which gives you the time to learn how to control it yourself without the help of the guide. Price: 130 JD/person for 2 days for 2-4 people. This includes all meals, the overnight stay, equipment for sleeping, the camels and the guide with his own camel. We can offer a number of routes for camel trekking, and if there is anything that you particularly want to see or a place you wish to visit, please tell us and we will work it in. 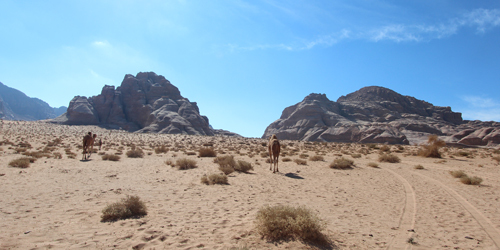 For the moment we are giving the prices only, without the routes - all of Wadi Rum is sufficiently beautiful that we presume the prices are what you chiefly with to know. Price: 140 JD/person for 2 days for 2-4 people. This includes the guide, the camels, the overnight stay, sleeping equipment and all meals. Start through the Rakebat Canyon towards the Barragh Canyon where we do some walking. We spend the night either near to Barragh or towards Jebel Burdah. 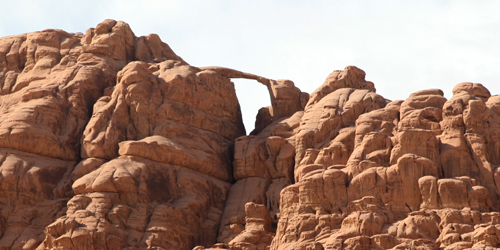 The next morning we start with a climb to the Burdah Arch. Later we hike through a very attractive narrow valley towards another rock bridge. This is a challenging and exciting program and you need to be in reasonably good condition. Price: 135 JD/person for 2-4 people. This includes all meals, the overnight and sleeping equipment and the guide. 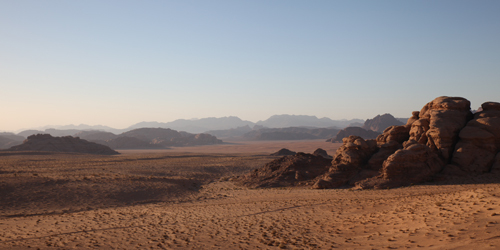 Starting from Wadi Rum in the afternoon, sleeping in the desert, climbing the mountain Jebel Um Adaami (the highest mountain in Jordan) early in the morning and continuing in the afternoon to Aqaba. Later we drive through the desert to reach the Desert Highway between Amman and Aqaba. Here a taxi will meet you to take you to any central point of Aqaba that you might indicate. Price: 90 JD/person for 2-3 people, 75 JD/person for 4-6 people. This price includes all meals, overnight stay and sleeping equipment, the guide and the taxi to Aqaba. After a night in the desert, we can bring you back to Rum Village by camel. It takes about 2 hours. Also possible at the end of any tour. If you are short of time the next morning, we could start you off on camels at the beginning of your trip and pick you up by jeep. 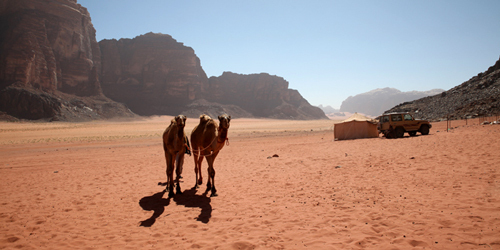 These rides are organized in the northern area of Wadi Rum. These rides depend on the weather and it is only on the day before that they can be guaranteed. Price: 130 JD/person (a maximum of 6 people can go at one time); Start is at sunrise, with a 20 km drive from the camp you start around 5 am. An extra night in the desert (in the camp or somewhere outside under the stars) can always be arranged either at the beginning or at the end of your visit. 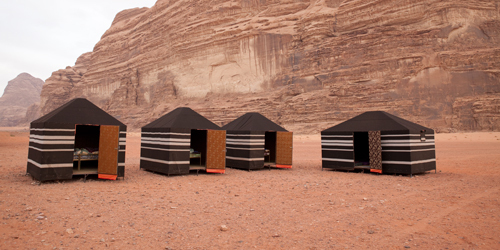 If you are looking for more than just two days in Wadi Rum there are a number of possibilities that can be added on to any of the other trips. Look as well for our three and more day programs. If you are traveling alone please send us a message and we will try our best to find a tour you can join to reduce the costs and make it as comfortable for you as possible. You can find our general information about our tours here.